Everyone wants love, companionship and contact. Those who can't get it from humans can turn to the latest crop of hot toy robots: Wall-E in three sizes, WowWee's Rovio, Femisapien and Mr. Personality, the dino D-Rex, multi-talented Elmo Live and Sony's enchantingly personable Rolly music player. Each exudes a desire to be your loyal friend from every noisy servo and glowing LED. But which should you choose? This is one weird bot. Turn it on and it will act like one of the many "personalities" you have downloaded to it, telling jokes, reading fortunes and interacting with you along the way. Pros: 3-legged, multi-directional wheels move in all directions easily; multiple personalities technically mean relief from boredom; depending on the personality, it'll call you "master"
Worth the money? Doubtful. Depending on the power of the development community some fun personalities may emerge, but they are severely limited by the options on the remote. Maybe the most technical bot of the bunch, the Rovio is a webcam-on-wheels controlled via an internet interface. With some smart maneuvering, you can snoop on your daughter's date in the living room from the privacy of your bedroom. Or, if you have your own domain server, you can control the Rovio from anywhere in the world. It has major limitations, like an awful camera and outside of Internet Explorer you can't hear any sound, but its API allows customization so there's true potential that has yet to be reached. Worth the money? Not yet. The Rovio is a great concept, but you'll be much better off waiting for version 2.0... or maybe 3.0. She's the female companion to Robosapien, and she'll blow you kisses, dance to music or speak in her very own gibberish language with you. She doesn't do anything very fancy, but she's the only girl here, so she looks better doing it than most of these other bots. Worth the money? Only if your name is Zoltan. The cheapest WALL-E of the crop, and a less expensive alternative to the Rolly, iDance WALL-E dances—if you can call it that—to the beat of your MP3 player, or his own built in sound bank. A one-trick pony, but I'll be damned if it isn't an adorable trick. Worth the money? When we first saw the iDance WALL-E, he was only supposed to cost $25 bucks. But now, at twice the price, it's definitely one bot we can live without. The name says it all: The biggest WALL-E of the litter is ultimate in every way. It will follow you around, dance to your music, or perform a pre-programmed series of movements and noises. 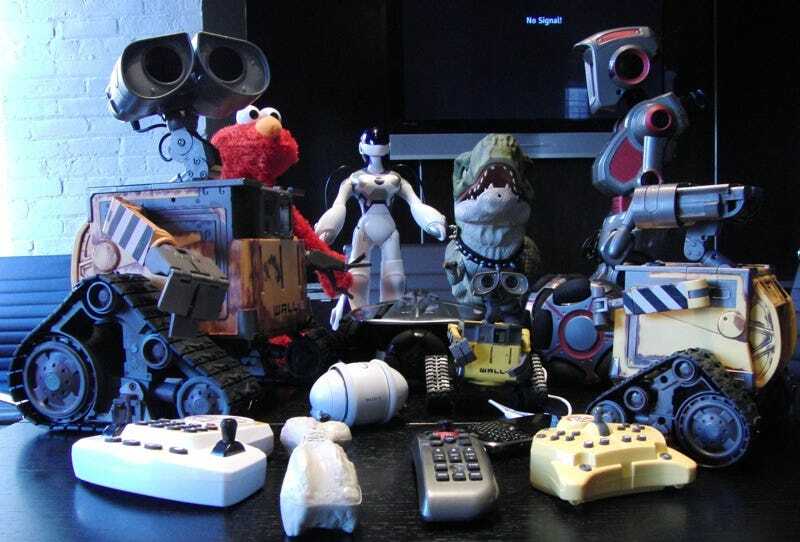 Best of all, it uses a really interesting controller that can move WALL-E using a touchpad. Cons: Expensive; controller has too many buttons that don't do very much; did I mention "expensive"? Worth the money? Who has that kind of money to spend on a robot? Especially one that isn't programmable, upgradable or all that intelligent. It should've stayed at its original $190 price. U-Command WALL-E is the Baby Bear of the WALL-E bunch, just right in almost every way. Its controls are comparable to the Ultimate WALL-E, it can move, dance and make noises on your command, all for a much more attractive price. Worth the money? Totally. Even at $130, it's one of the cheaper robots on the list, and the most fun right out of the box. At first glance, the Rolly doesn't fit the traditional robot mold. The egg-shaped MP3 speaker looks like it's just another smooth white gadget with an "i" in front of its name. But when you see it in action, it's one of the most exciting little toys around, dancing wildly and putting on a light show to the rhythm of the songs coming from its body. Worth the money? Surprisingly, it might well be. I can't put my finger on it exactly, but I get a huge kick out of the Rolly. The fluidity and snazziness of the movement and lights explains the steep cost. The scariest bot of the lot, D-Rex growls, attacks and lets out the sounds of bodily functions from every orifice. Rubbery, lizard-like skin and huge, moving yellow eyes add to the effect. Worth the money? Tough call. D-Rex is probably the biggest robot here and isn't that expensive for being so big. But since it only performs a few functions, don't expect anything close to a Pleo. What's left to say about the newest version of every kid's favorite fuzzy friend? It raps, dances and tells stories and jokes, all in the body of the most popular Muppet of a generation. Pros: Buy this for your kids and they will love you forever. Worth the money? Do you have a choice? At $60 it's a steal compared to most of these other bots... but good luck finding it. The Winner: U-Command WALL-E. One of the few bots here that is fun to play with more than once, this WALL-E is cute, interactive and kids can enjoy him without driving parents crazy by playing the same thing over and over—*cough*Elmo Live*cough*. Runner-Up: Rolly. I can't stop looking at this little dude. His syncopated dancing demands attention from anyone who sees him, and he is the bot that performs his most essential function—playing music through a speaker—the best. Honorable Mention: iDance WALL-E and Ultimate WALL-E. I like you both a lot, but why did you get me all excited with your decent prices, and then double them when I wasn't looking? Not cool guys. The Loser: Rovio. No offense here Rovio, we really like the though of a remote controlled, customizable webcam and we think you will get it right one day, but right now you cost too much and the most important feature you have—your webcam—is absolutely terrible.